Authentically designed and beautifully maintained private Beachfront Vacation property near Tulum on pristine and coveted Soliman Bay! These beaches are rated in the top 10 in the world protected by the worlds second largest coral reef. Newly remodeled with high end, hotel quality mattresses, linens, curtains, towels, , swimming pool, beautiful gardens, full time staff, secure parking, free wifi, lots of extras! Two air conditioned King Master Suites & Upstairs Loft with 2 twin beds. Kitchen, Great Room, patio. Rent Separately or as a group. All with full kitchens and patio or terrace dining. Casa Playa Maya is perfect and the most popular family vacation spot on the Riviera Maya! Private and secure gated community, a world apart yet just 10 minutes to both Tulum and Akumal on the Riviera Maya. Imagine... STEP OFF YOUR COVERED PATIO ONTO YOUR PRIVATE CORAL SAND BEACH. Casa Playa Maya is a wonderful Beachfront Villa located about halfway between Tulum and Akumal, Mexico on the Riviera Maya. Soliman Bay is protected by the second largest coral reef in the world for great snorkeling and abundant sea life. This area is world famous for eco-tourism and Soliman Bay is noted for bird watching, especially in the large mangrove preserve adjacent. Less than 10 minutes from shopping and dining. Book your magical tropical getaway today. I grew up traveling. After spending several years in NYC, I relocated to tiny Tulum to enjoy the good life. Here I set up my property management business and started my family. I'm the property manager and am happy to share your vacation with you. My staff and I do everything we can to make sure your time here is a relaxing, unforgettable experience. We can help arrange special requests before your stay, such as airport transportation or grocery shopping. We work with the staff on site to assist with anything you need during your stay. Our office is conveniently located in Tulum town, but we look forward to greeting you at the beach house. I enjoy traveling, spending time with my family, exploring, and a good road trip. We look forward to seeing you down here soon and sharing some of our insider secrets with you. Casa Playa Maya was developed in the PRIME location - protected in the centre of this reef-fringed, protected bay. Soliman Bay is still largely undiscovered so the beach is never crowded. Year round you will enjoy gentle cool sea breezes, white, sandy beaches and warm water temperatures. It's the perfect location for private holidays, family gatherings or weddings. This is a kids paradise, better than Summer Camp we are told by lots of kids and parents too! Abundant sea life. Come swim with the turtles. The Soliman Bay area is filled with attractions from Chichen Itza, Coba, Tulum, and Cozumel with ancient ruins and excellent diving and snorkeling. Soliman Bay is considered a world class beach with powder sand and reef-protected snorkeling. Nearby you will find world class dining. Other day trips can include other local attractions such as: Xel-Ha Eco Park (4 km) and Sian Kaan Biosphere Reserve (12 km), and Trent Jones 36 hole golf course (10 km). Full concierge services are available throughout your visit. Casa Playa Maya is your affordable base for your family or group exploration of this still largely undiscovered paradise. Super clean, traditional Mexican tile with walk in, large shower with rain shower heads. Just look down, you are on the beach! The house has Caribbean view as do both master suites and the upstairs casita. Downstairs casita is on the beach also with views of the garden and coconut palms. The reef lines the bay to the turquoise Caribbean. The Bay is dotted with coral heads teeming with colorful tropical fish and sea life. Healthy corals of all descriptions. Perfect to swim or snorkel. MAIN HOUSE sits on perfect Caribbean dream beach. Reef tempers the waves, perfect for snorkeling! Pristine, protected residential gated Bay community. Quiet and secure. Warm, gentle and pristine bay gently laps at your toes. Perfect for small ones, great fun for all! Kayak a little way out and see all kinds of fish. Only Cell Service here. We have cell phones for guest use during stay, ask. And of course lots of BEACH TOWELS! We have kayaks, which make for a great workout! Traditional Great Room 28 foot diameter 30 foot high Central Great Room/will full kitchen. Yes, of course! Gotta keep the coconuts cold and the cervezas frosty! Range, oven and grill top. Hot and ready each morning. Basic items to get you started. No worries! Everything you need and all that you want! Kitchens in Main Villa and each Casita, fully equipped. Everything you will need. SMART LG Television in Main Villa. New HD Sony 400 Watt Dolby 5.1 system w/ iPod input. Four shelves full of books. We accumulate beach toys from our guests who leave them which you are more than welcome to use. We recommend throwing in a flat air mattress for floating in the bay. I have a few, bring your own. Coconut Palms (ask for a fresh one for a refreshing drink) and native exotics... glorious! 5 kayaks... no instructions required, just go out there and paddle. Best front porch on the bay... covered and right on the beach. 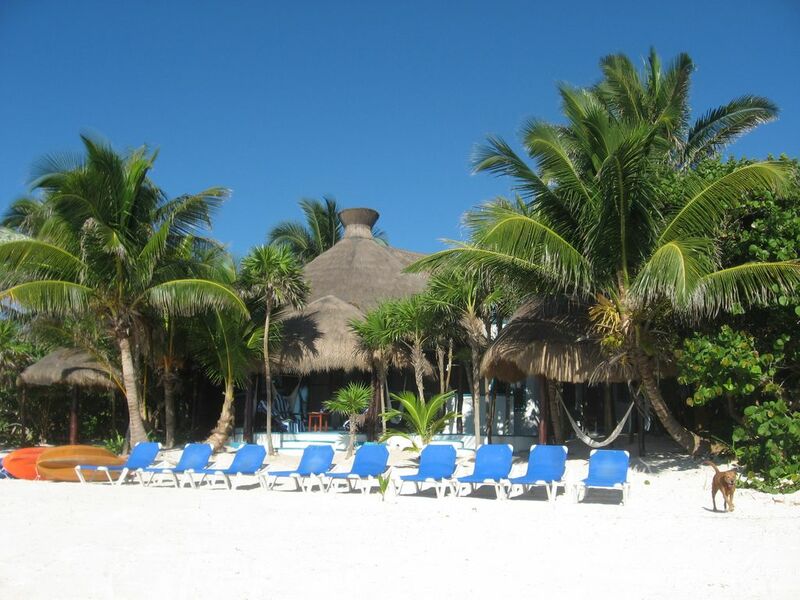 We have the nicest Palapa (straw thatch gazebo) with hammocks and lounge chairs. Perfect Mexican Beach Experience! Paddle boards and snorkeling gear available for ur guest. Lower level Beachfront Villa and bedroom accessible. Please, no smoking inside. Outdoor smoking OK. Havana Cigars available. We have a brand new swimming pool with a shallow section specially for kids. Shared with the main house and 4 casitas and located in our private garden area. Beach chairs, blenders, kayaks, cook available, babysitting available, A/C in all bedrooms, SAT TV-HBO ETC, High speed WIFI. This was perfect vacation spot for our family, although would have been nice to have AC in main room and loft. Luckily we had nice breezes the entire time so feel we lucked out. Soliman Bay is good 15 minute drive in to town but we enjoyed cooking breakfast and lunch and then headed in to Tulum for dinner. Worked well for us. We enjoyed playing many games of chess and snorkeling. Very relaxing, on a beautiful beach. This was a basic but lovely two bedroom cottage right on the beach. My husband and I went with our two teenage children. Luis and his family were very gracious and helpful. Wendy was very easy to deal with and responded quickly to my numerous questions. This spot was ideal for us and one of our daughters and family. The bay is gorgeous and we were right on the bay. Kayaking and swimming and snorkeling out the front door. Luis and Anabel took very good care of us. They are the best. Great house, pool, and casitas. Easy access to full grocery stores and a wonderful restaurant down the beach for lunch. Everyone was incredibly kind, helpful and accommodating, from amenities to advise. I would highly recommend this property! 2 adults and 2 teenagers Xmas week at the house-- LOVED our stay! The location is great for activities (don't miss the Tulum and Coba ruins, local cenotes, and the monkey sanctuary), and kayaking, paddle boarding and snorkeling off the beautiful beach out your front door. Easy to cook in the kitchen and local markets are easy to fine-- beds are comfortable. We all enjoyed our week!! Minutes away from famous Xel-ha, X-plor and Xcaret nature/amusement parks. Underground River and Cave exploring at nearby Dos Ojos Cenotes. (underground fresh water rivers and sinkholes). Great for diving, snorkeling or just visiting. Kite Boarding School at Tulum Beach. Area is famous for spectacular Mayan ruins of Tulum, Coba and the amazing Ek Balam and Chichen Itza. Ecological park Sian Kaan near Tulum Beach. Sea turtle preserve and snorkeling in Akumal. We are at KM Marker Cancun-Tulum Highway 241, just a sand road entrance across the street from Oscar y Lalo's Restaurant! 10 Min North to Akumal, 10 Min South to Tulum. Best Private gated residential community of the Riviera Maya. For more than 18 years this has been the perfect family vacation destination with a spacious main house and two private casitas. Sleeps 10 in beds (additional 4 on air mattresses, if needed). Friendly, knowledgeable property management staff will greet you and assist with any of your vacation needs. We are happy to arrange airport transportation, babysitting services, or book a tour. On-site caretaker and cleaning lady ensure that you feel at home during your stay. They are available for laundry service, cooking, grocery purchases, and more. Don't Need all that Room? Contact us to rent one casita. Palapas, Beachfront Patio, BBQ grill, 5 Kayaks, 10 beach chairs, A/C in bedrooms, blenders for those tropical drinks. We have everything to make your beach vacation perfect! ALL PRICE ARE FOR THE MAIN BEACH HOUSE ONLY Prices for casitas are additional. Please inquire by email.